The festival’s opening night concert features the Empty Cage Quartet and the Sun Ra Tribute Band. The all-star ten-piece Sun Ra Tribute Band returns to open the festival and honor the inspirational iconoclast Sun Ra by playing many of his compositions from the late 1950’s and early 1960’s. Expect sparkly robes, processions, group vocals, flying objects and planetary realignment. The cast of characters includes Seattle new-music godfathers Stuart Dempster and William O. Smith. The Empty Cage Quartet (Jason Mears, reeds; Kris Tiner, trumpets/flugelhorn; Paul Kikuchi, drums/percussion; Ivan Johnson, bass) has been consistently praised by critics as one of the most interesting and original new jazz groups to emerge from the American West Coast. 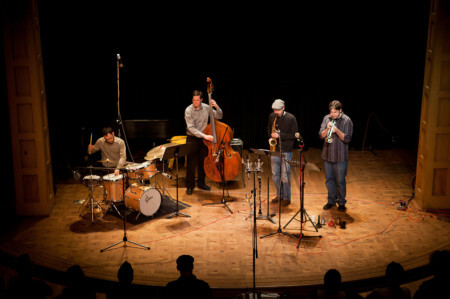 For over eight years the group has explored new ways to integrate a diverse mix of musical influences, utilizing a unique system that blurs the lines between composition and improvisation.